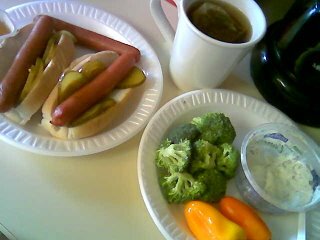 Lunch consisted of some hot dogs and a side dish of vegetables and a dill dipping sauce. All around tasty and higher in vegetable matter than a lot of the lunches I've been having lately. The Farm Share is picking up, so my wife and I are getting organic, locally grown vegetables every week as a result. Three other families who live in our area have shares form the same location, and we're splitting up the responsibility of heading down to Jamaica Plain for the pickup. I haven't been posting to the food blog lately, due in part to the massive amount of time taken up by the process of getting the house ready for, and cleaning up after, our Fourth of July party. I'm going to try and be better about posting, and hopefully be better about preparing healthier meals. It'll be hard not to, with all the vegetables in the house now.